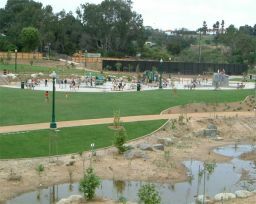 Comments: Huge park with all sorts of structures and activities for kids of all ages. Play Equipment: 2 sets of swings, both for young toddlers and regular ones. Large playstructure with slides, tunnels and other things. Rock climbing, large sandy area, grassy area and even a waterfall structure. Pond/Ducks: Yes there is a pond, but no ducks.